We are leading manufacture of cotton wet mop refill and dry mop refill dust mop refill. Color White, Red, Yellow, Green, Blue. Our organization has built up recognized corner for itself in industry and turn into the business' most driving association by gigantically fulfilling its profitable clients. 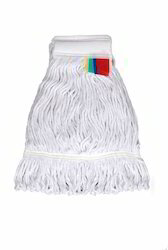 We are holding specialization in offering an unrivaled quality scope of Cotton Mop Refill. Our Mop Refill is endorsed with quality and is according to the particular subtle elements of clients.